Agilent Technologies introduces the E4982A LCR meters designed for R&D and quality assurance applications. The newest addition to the Agilent’s LCR family of meters, the E4982A delivers superior performance for manufacturing passive components such as SMD inductors and EMI filters, where impedance testing at frequencies of 1 MHz to 3 GHz is required. Makers of chip inductor/EMI filters and integrators of chip inductor/EMI filter test systems are driven by the need for accurate and repeatable inductance, quality factor and impedance measurements. They are also under continual pressure to improve throughput and test yield while keeping test costs low. 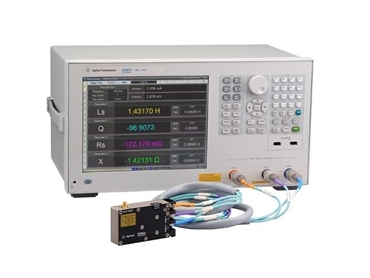 The Agilent E4982A LCR meters offer 0.8% basic impedance measurement accuracy and repeatable measurements with small measurement variation while also delivering measurement speeds of 0.9 ms, 2.1ms or 3.7 ms. The meter's accuracy improves test quality, while its measurement speed translates into fast test throughput. According to Akira Nukiyama, vice president and general manager of Agilent's Component Test Division, Japan, the features of the new E4982A LCR meters ensure fast, accurate impedance measurements for manufacturers and system integrators while realising improved test efficiency and a lower overall cost of test.